Woodpecker has those two security features which prevent our users from sending or receiving unwanted emails. So what is the role of each of them? This feature blocks incoming mail. 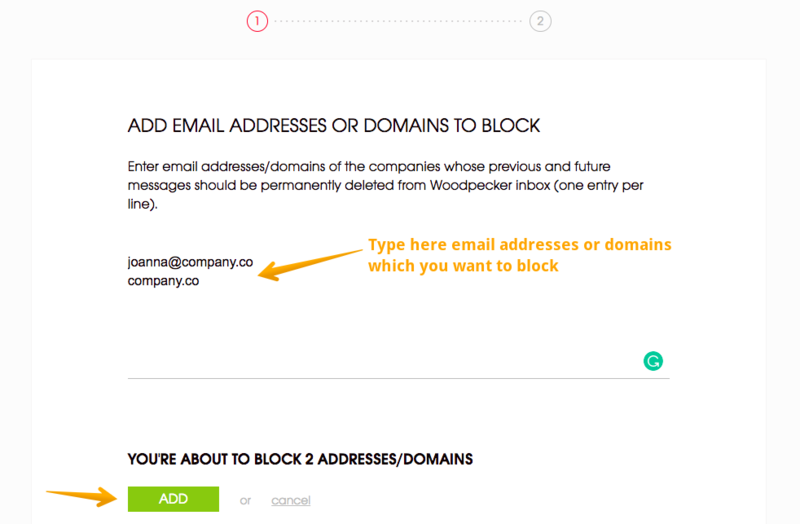 You can add email addresses or the domains if you want to make sure that they won't appear in your Woodpecker inbox. Q: How to set up Blocked correspondence on my account? A: Go to Settings → Email Accounts and click your mailbox. Please, notice that adding a domain to Blocked Correspondence causes that all the emails sent previously from this domain will be removed from Woodpecker Inbox. You can read more about incoming mail in Woodpecker here. Safety Tab feature, on the other hand, blocks the outgoing mail. Domains included in the Safety Tab won't be marked as BLACKLIST right after you'll add them. However, if you accidentally upload some emails under those domains as prospects in any of your campaigns, Woodpecker will assign the status BLACKLIST to them. Q: How to add domains to the Safety Tab? Click 'Add domain' and type the domains which you want to blacklist. You can find more information on how does blacklisting domains work here.